A documentary on Rut Bryk produced by EMMA will premiere on 2 April. It is shown in the exhibition space in the middle of the Bryk & Wirkkala Visible Storage. Artist Maaria Wirkkala's work Mosaics of the Mind is displayed until April 14th alongside the documentary. Rut Bryk: Perhosen kosketus (“Touch of a Butterfly”) is a warm portrayal of the artist. 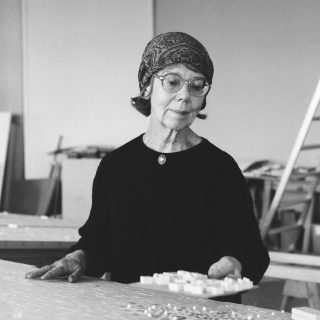 Rut Bryk (1916–1999) was a pioneer in modern ceramic art. 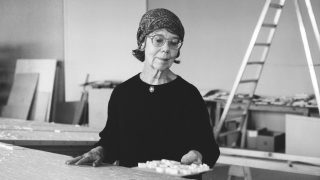 She left an extensive production of sensitive ceramic works for future generations, but no words to explain them. 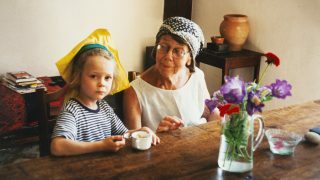 In the intimate documentary, experts on the artist and her immediate circle convey an image of Rut Bryk as a person at home in both global metropolises as well as the middle of Lapland’s wilderness. In addition to the documentary, EMMA will display artist Maaria Wirkkala’s work Mosaics of the Mind (2019), which is founded on the basic unit of Rut Bryk’s thinking and art: the ceramic module. The work is a biography without words. Mosaics of the Mind will be on display at EMMA until 14 April, when it will travel to Japan as part of the Rut Bryk touring exhibition. The Tapio Wirkkala Rut Bryk Foundation Collection comprises the personal archives of two legendary Finnish designers. It is also the largest existing collection of works by the artist couple.